Surf and Turf is a complex featuring a water park and a beach club, located in a quiet inlet of Nusa Dua Bay. It features a swimming pool, restaurant and bar, water slides, canoeing, and snorkeling-a particularly popular spot for families. Among these activities, the one that we would like to highlight the most is Bali's first ever Surf Rider (wave rider). 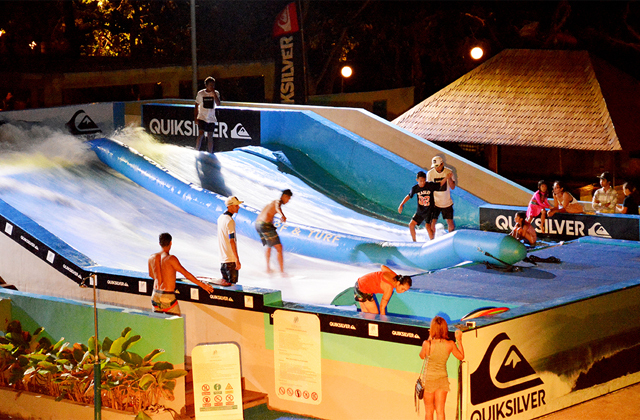 This activity features water rushing up a slope to create artificial waves, allowing riders to enjoy a similar experience as surfing in the sea. Why not challenge yourself to take on the waves? Only for Flow Riders Open 10:00-19:00. You can rent a towel and locker.